As we continued to gather and process information for a tender package for our self build, windows were the next big ticket item on the list. We were advised to work within a budget of approximately 10% of the build cost for alu-clad passive certified windows, and to send out a window schedule for pricing prior to issuing a tender. The most expensive quote was approximately twice the price of the least expensive! We needed to see the windows in person to appreciate the cost benefit of the different options. One commonality was that the extensive glazing in the kitchen – two walls of six metre wide floor-to-ceiling glazing meeting at a corner – contributed approximately half of the cost of the 33 windows in the house. 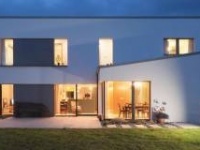 As Jeff O’Toole had advised prior to completing the PHPP calculations, it would be challenging to achieve the necessary airtightness for the passive house standard with a pair of three metre wide sliding glass doors. The window suppliers all suggested fixed glazing for all units in the kitchen, defeating the purpose of the covered deck area adjacent to the kitchen. 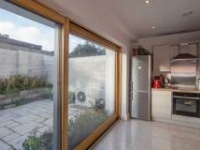 Extensive glazing in the kitchen – two walls of six metre wide floor-to-ceiling glazing meeting at a corner – contributed approximately half of the cost of the 33 windows in the house. From a practical point of view, two walls of glass and one wall of kitchen units leaves very little wall space. We felt this limited the function of much of the space in the kitchen. One glass wall directly faces the boundary wall of the site which is only six metres away. These considerations, together with discussions on the structural requirements to support the large roof overhang, made us rethink the huge expanse of glazing at the back of the house. Another one step forward, taking us two steps back. 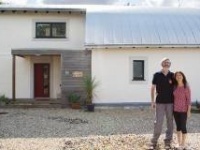 With this conundrum in mind, we set off for the Self Build Show in Belfast one dreary Sunday afternoon, with the hope of a blitz of efficient information gathering to make a few informed decisions and fast track the process after weeks of little progress. Our main aim was to speak to window suppliers, timber frame manufacturers, and suppliers of heat pumps and heat recovery ventilation systems. It was time well spent – there’s nothing like face to face discussion and being able to see and feel the products to get a sense of the quality of products and service you might expect from suppliers. We got a great appreciation for the variation in quality and aesthetics from the window displays and thought the quality was in proportion to the pricing, in that you get what you pay for. We spoke to several timber frame manufacturers and discussed their approach and the options for our project, leaving this particular topic with more questions than answers. 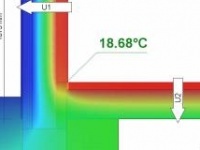 When it came to heat recovery ventilation and heat pump technology, we didn’t get a sense of impartial advice. A few exhibitors at the show hit us with the hard sell, assuring us that their option was the best fit and scaremongering that all the prior advice we had been given was incorrect. After five hours of listening to the sales spiels of the various reps, with only the typically poor sustenance on offer in the exhibition arena to keep us going, we were exhausted. Going back to rewiring my long-term admiration of walnut joinery and picking an alternative for the doors, architrave, skirting and window boards – in my mind, this is a big decision, and one that may limit options for yet to be chosen floor/wall finishes throughout the whole house. In my mind, the next obvious choice was oak and personally I prefer bolder colours. This in mind, I went along to ‘an evening of colour’ at my local Colourtrend shop, in an effort to pick up some tips on where to start with selecting colours for the blank canvas a new build is. Our current home is covered from top to bottom in Colourtrend paint. I’ve returned time and time again because of the beautiful colours, and because it’s Irish, really durable and the staff at my local showroom are really helpful and full of great advice for decorating. I had high hopes, and was not disappointed. Adele Roche, a colour specialist and interior designer, gave a very practical and informative talk that really resonated with me. She described an inclination I recognised in myself, a love of natural wood and a senseless notion that it’s not really a colour, and painting it is depraved. At the end of the day, wood has a colour – usually a hue of yellow – that must be considered when choosing a colour scheme. Adele showed some photos of projects she had completed recently, examples of stunning joinery painted navy and burnt orange. This was a eureka moment and a decision was made: specify primed joinery on our tender and hire Adele when the decision needs to be made on what colour the joinery will end up. This felt like a big step forward in the process!